Last year I had to switch classrooms with a first grade teacher, so it was chaos for me up until the first day. This year, my room was fairly easy to put back together, which I was so happy about. It really gave me time to work on other things-like my Monday Made It! Link up and join in! 1. A Writing Conference Ribbon for the kids to clip their writing pins when they are ready for teacher edit. I got the idea from Pinterest. 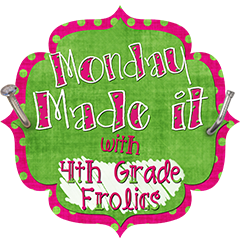 I made it in Power Point with a free font called Jumpin' Jack from Miss Tina's Fonts and I downloaded the free polka dot border from Ms. Fultz's Corner. I hot glued ribbon on the back and hung it to the shelf by my table. 2. A Homework Folder and Spiral Baskets for the kids to put their folders and spirals in each morning BEFORE they go to recess. The font is Janda Silly Monkey and can be downloaded for free at Fontspace. The clip art is from a collection called Superkids from Thistle Girl Designs. I love their clip art! 3. A Math Wall Banner for the wall at the back of my room. I have seen so many of these in pictures of other classrooms that I just had to make one myself. I don't have a fancy cutting machine (yet! ), so I used some leftover letters I already had. I took regular cardstock, marked 4.25 inches in, turned it at an angle and used my cutter to cut the flags. I used a fine tip sharpie to make a nice border and glued the letters on. One of my favorite things to have at home (besides a 3 hole punch and stapler!) is my laminator. It's perfect for smallish projects like this. Here is the finished project. I punched holes and tied the flags together using rainbow ribbon that I found at Walmart for $1.97. I can't wait to hang it up tomorrow! I love your banner! I am your latest follower--I would love to have you come and visit my blog--you could win a laminator for school as well as the one you have at home! I love your banner!! Great idea to add the extra detail of border on the pennants. I was SO CLOSE to buying my own laminator on Amazon today, but I didn't. We have one at school, of course, but it's pretty much on lockdown and they have "volunteers" to do it, so you have to put it on the list of "to do" and then wait until someone comes in to do it. I should have bought one, huh? LOL!